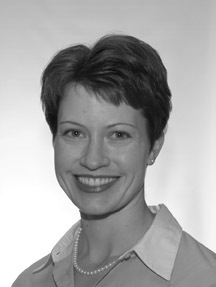 Dr. Green is currently Chief Resident in the Department of Diagnostic Radiology, Yale University School of Medicine, New Haven, CT. She earned her ScB in Neuroscience from Brown University, her MMS in History of Medicine and Pharmacology from Brown Graduate School, and her MD from Brown Medical School, Providence, RI. She will begin a fellowship in women's imaging at Brigham and Women's Hospital in Boston, MA, in July 2005. The use of magnetic resonance imaging (MRI) to visualize a fetus in utero was first reported in 1983. 1 Initially, fetal MRI was largely limited to imaging of the central nervous system (CNS). 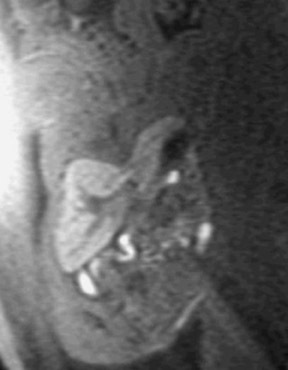 More recently, however, technical advances have made possible MRI of in-tratho-racic abnormalities. These developments have paralleled advances in fetal and neonatal surgery for thoracic pathologic conditions, which have increased the relevance and utility of MRI. While ultrasound remains the mainstay of fetal imaging, it is sometimes technically limited by small field-of-view, maternal obesity, oligohydramnios, and obscuration of fetal anatomy due to a vertex lie position late in pregnancy. This article will discuss technical developments that have expanded the role of MRI in prenatal diagnosis of thoracic abnormalities, thereby facilitating treatment and patient counseling. Several representative thoracic abnormalities will be discussed specifically with respect to the impact of fetal MRI on diagnosis and treatment. Fetal MRI was initially limited by technical factors. Conventional spin-echo and gradient-echo sequences were slow and produced relatively low-resolution images. Imaging times were reduced by echoplanar techniques and initially applied to fetal volumetric measurements, 2,3 but images suffered from susceptibility and chemical shift artifact, low signal-to-noise ratio (SNR), poor spatial resolution, and the need for special hardware. 4,5 Although several early reports described fetal anatomy, 6-8 MRI in the pregnant patient was mostly limited to evaluation of maternal anatomy such as pelvimetry 9 and pelvic masses complicating pregnancy. 10,11 Early fetal MRI was most useful in delineating CNS anomalies found on ultrasound, particularly later in pregnancy when ossification of the fetal skull and fetal vertex lie limited visualization by ultrasound. Early attempts to reduce fetal motion during long pulse sequences included neuromuscular blockade or sedation. Pancuronium bromide was administered to the fetus by intramuscular or umbilical vein injection, but this was abandoned due to impracticality of umbilical vein access. Oral diazepam was also given to the mother in an effort to reduce fetal motion. In the 2 decades since the first reported use of fetal MRI, increased availability of high-field-strength systems and new pulse sequences have made possible dramatic improvements in fetal imaging. 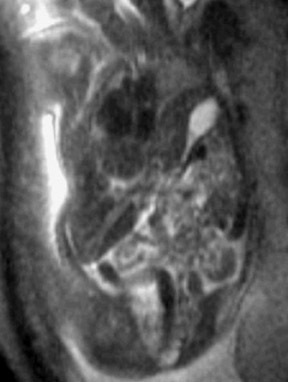 Since the 1990s, fetal MRI has primarily relied on variants of the rapid acquisition with relaxation enhancement (RARE) technique for fast T2-weighted imaging. These include single-shot fast spin-echo (SSFSE; GE Healthcare, Milwaukee, WI) and half-Fourier acquisition single-shot turbo spin-echo (HASTE; Siemens, Erlangen, Germany). A few technical considerations are helpful to illustrate recent improvements over previous pulse sequences. SSFSE and HASTE use a single radiofrequency pulse to excite a tissue slice with multiple phase- encoding steps. Because the repetition time (TR) is essentially infinite, heavily T2weighted images are produced that are particularly well-suited to imaging fluid-filled fetal structures. Each slice can be obtained in <1 second, thereby minimizing motion artifact. Images are usually acquired using single-slice technique instead of interleaved multislice technique. Slices are usually acquired in 5-mm intervals. Aflip angle of 150° may be used to improve SNR, and angles >150° may be avoided to decrease the specific absorption rate (SAR). 12 Most protocols obtain T2-weighted SSFSE-type images in 3 planes, often oriented with respect to the fetal body axis. Coakley and colleagues 13 recently pro-vided a sample protocol for fetal MRI. T1-weighted images are obtained primarily for the visualization of fat and hemorrhage, plus special applications like spectral water suppression to evaluate the skeletal system. 14 Most protocols use spoiled-gradient echo imaging limited to the area of clinical interest. High-field (3T) magnets, parallel imaging, and real-time imaging are recent developments in MRI technology that have potential benefits for fetal imaging. Improved SNR and higher spatial resolution afforded by new 3T magnets could improve visualization of small fetal structures and, possibly, shorten imaging time. Unfortunately, depending on implementation, SAR deposition may increase at 3T, which is an especially important consideration for fetal imaging. Several of the currently used modifications to reduce SAR deposition, such as limiting total number of slices and reducing flip angle, will likely prove useful in implementing 3T systems in fetal MRI examinations. Parallel imaging offers faster image acquisition with the potential benefit of SAR reduction. 15 McKenzie and colleagues 16 reported im-proved quality of fetal MRI images via increased SNR efficiency strategy in array spatial and sensitivity-encoding technique (ASSET; GE Medical Systems), a form of parallel imaging. Levine and colleagues 17 recently described the use of real-time single-shot fast spin echo (RT-SSFSE) in fetal MRI. In this technique, SSFSE images are obtained through a prescribed region-of-interest, and image reconstruction is available nearly immediately after acquisition of a single slice. They reported improved orthogonal views with respect to the fetal body axis and increased SNR due to re-duced cross-talk (as occurs when multiple slices are obtained at the same time). Examinations are best performed after 20 weeks' gestation for several reasons. First, there is better conspicuity of fetal anatomy as the fetus gets larger. Second, most examinations are prompted by abnormal findings from the prenatal ultrasound examination, usually performed at approximately 20 weeks. Third, timing of the study is important to determine its clinical utility. Termination of pregnancy and fetal surgery are time-dependent in-terventions. Fetal surgery is usually performed between 26 and 29 weeks, and imaging is best obtained in close proximity to the time of surgery because the second trimester is a period of rapid growth and change. 18 Levine 19 has advocated for the use of an ultrasound examination immediately preceding MRI, to show change or even resolution of an anomaly diagnosed on a previously performed ultrasound, to narrow the differential diagnosis, or rarely, to detect fetal demise that obviates the need for fetal MRI. Although no known risk exists for either fetus or mother, no prospective human trial has been conducted to prove the safety of fetal MRI, and written consent may be obtained prior to performing the examination (this practice varies in different locations). Theoretical risk during organogenesis ordinarily limits the use of fetal MRI to the second and third trimesters. Gadolinium is not required for fetal MRI but may be used for maternal indications if the benefits are felt to outweigh the risks. 20 Gadolinium presents a theoretical risk to the fetus due to dechelation and the release of free gadolinium within the amniotic fluid and fetal circulation. Nevertheless, no adverse effect on fetal mice was found when gadolinium was administered to pregnant mice. 21 Discussion of the risks and benefits with the patient is of paramount importance. Because the fetal lungs are fluid-filled, they are easily visualized on T2-weighted sequences (Figure 1), and with the advent of faster sequences, they have been the subject of much research. Pulmonary hypoplasia is defined as lungs that are too small in size for the gestational age, and it may result in neonatal respiratory distress and occasionally death. Causes include intrathoracic masses, oligohydramnios, neuromuscular dysfunction, or abnormalities of the bony thorax. Rarely, it may be primary. Estimation of fetal lung volume has previously relied on thoracic circumference measurements on ultrasound and comparison to nomograms to predict lung development. 22 This method indirectly measures fetal lung volume and may be less accurate for fetuses with intrauterine growth retardation. The development of fast T2-weighted sequences has enabled researchers to directly measure fetal lung volumes with good success. MRI provides greater resolution of lung tissue from surrounding soft-tissue structures than does ultrasound and thereby may facilitate more accurate measurements. Coakley and colleagues 23 used RARE sequences to measure fetal lung volumes and found excellent correlation with biometric measurements obtained by ultrasound. Recently, Osada and colleagues 24 reported that quantitative lung volume measurements on MRI correlated directly with clinical outcome. Research is ongoing to ascertain whether MRI can play a role in the evaluation of intrinsic lung properties such as relaxation time, which may predict the degree of lung maturity. On ultrasound, CDH can present a diagnostic dilemma because lung tissue is similar in echotexture to liver; thus, liver position may be difficult to determine on ultrasound. Indirect signs of CDH on ultrasound include posterior displacement of the stomach with liver-up, left-sided CDH 28 and supradiaphragmatic displacement of the portal and hepatic veins on Doppler ultrasound. 25 Success in diagnosing CDH on ultrasound is variable: for example, in 92 fetuses diagnosed with CDH, the diagnosis was missed on prenatal ultrasound in 44 (48%). 29 In contrast, liver tissue is easy to differentiate from lung tissue on MRI because the lung is hyperintense on T2-weighted images and the liver is hypointense (and vice versa on T1-weighted images). Bowel is also hyperintense on T2-weighted images but can be distinguished from the homogeneous pulmonary pa renchyma due to the excellent soft-tissue resolution afforded by MRI. Several studies have shown equal or greater accuracy of MRI diagnosis of CDH compared with ultrasound (Table 1). 30-32 In cases where MRI and ultrasound were equally efficacious at diagnosing CDH, MRI may more completely define the anatomy. In one study, MRI was judged to have provided additional anatomic detail in 14 fetuses in whom CDH was diagnosed on both ultrasound and MRI (11 of which were liver-up). 30 The larger field-of-view afforded by MRI can also show additional abnormalities that affect the fetus's prognosis and potential eligibility for fetal surgery. 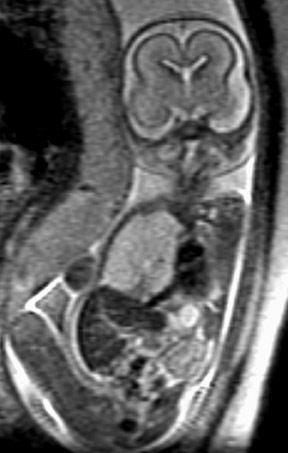 MRI readily facilitates differentiation of liver-up and liver-down CDH, which is important for prenatal counseling due to the much poorer prognosis for liver-up CDH. 19 Liver position also determines eligibility for in utero tracheal occlusion surgery (selection criteria for in utero tracheal occlusion surgery are provided in Table 2). 18 Although Levine and colleagues 33 reported 100% concordance between ultrasound and MRI in determining liver position, lower success rates have been reported by other investigators. 30 Comprehensive visualization of anatomy can help physicians and patients anticipate a need for birth at a tertiary care center and thus facilitate prenatal planning. For example, Huppert and colleagues 34 reported a case of a right-sided CDH that was seen on MRI (but not ultrasound) and prompted referral to a tertiary care center for delivery. MRI helps to distinguish CDH from other intrathoracic masses that may be indistinguishable on ultrasound. 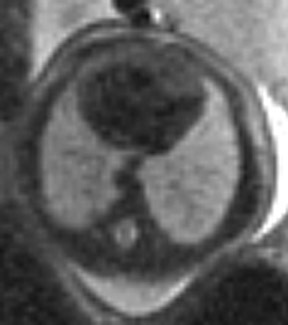 For example, a left-sided liver-down CDH may be differentiated from a cystic mass, such as cystic adenomatoid malformation, due to the hyperintensity of these entities on T2-weighted images. In one article, 2 right-sided and 1 left-sided CDHs were misdiagnosed as congenital cystic adenomatoid malformations (CCAMs) on ultrasound but were correctly identified on MRI. 32 Finally, MRI may be useful for volumetric measurements of the lungs to predict, although further research is needed to better define the role of MRI volumetry. 35 In summary, the best role of MRI in prenatal diagnosis of CDH is probably in identifying liver position and differentiating CDH from lesions that appear similar on ultrasound. On ultrasound, BPS appears as a well-demarcated, wedge-shaped, echogenic mass; ultrasound uncommonly shows the systemic feeding artery. 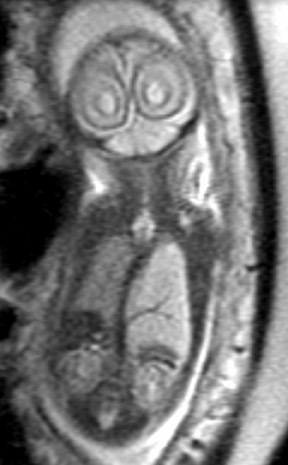 MRI shows BPS as a well-defined, uniformly hyperintense mass on T2-weighted images that is just below the signal intensity of surrounding amniotic fluid. Over time, regressing BPS may appear less hyperintense. 33 A unilateral pleural effusion may be seen with extralobar BPS. When subdiaphragmatic, BPS may be confused with congenital neuroblastoma or adrenal hemorrhage on ultrasound. 38 MRI helps to distinguish between these entities because hemorrhage is hyperintense on T1-weighted MR images, whereas BPS will be hypointense. BPS is homogeneous on MRI compared with the heterogeneous appearance of neuroblastoma. 25 This feature also helps differentiate it from a macrocystic CCAM and CDH, both of which are heterogeneous. 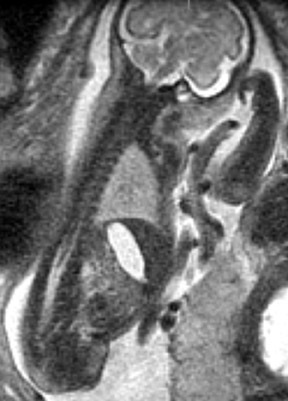 The primary role of MRI in diagnosis of BPS is differentiating it from other lesions that are more likely to require in utero treatment, and also may be beneficial for follow-up to monitor for growth and development of hydrops. Treatment of BPS is indicated if hydrops or other complications develop and is similar to that performed for CCAM, as described above. The role of MRI in diagnosis and treatment of in utero intrathoracic pathologic lesions is still being defined. Certainly, ultrasound will remain the mainstay of fetal imaging. MRI offers several technical advantages over ultrasound, including a larger field-of-view, less limitation due to maternal habitus, and ability to visualize fetal anatomy regardless of fetal presentation. Fetal MRI may provide information in addition to that from ultrasound and may affect care of fetuses in whom intra-thoracic pathologic lesions have been diagnosed (Table 3). 33 Developments in fetal surgery, such as temporary tracheal occlusion for CDH, EXIT procedure for CHAOS, and in utero resection of CCAM, all benefit from the superior anatomical depiction and mass characterization that MRI offers. Less quantifiable, but perhaps even more important, is the greater ease of recognition of anatomy that MRI provides that facilitates patient counseling and consultation with referring clinicians. MR spectroscopy of the lungs and volumetric assessment of pulmonary hypoplasia are just 2 of many future research developments on the horizon. Magnetic resonance imaging of fetal thoracic abnormalities. Appl Radiol.